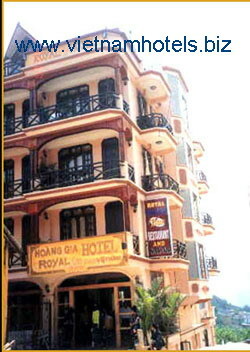 Located heartily in Sapa town, Royal Hotel brings the utmost comfort and convinience to guests in a very cozy atmosphere. The hotel offers unrival view towards Muong Hoa valley, rice terraces and Fansipan mountain. Friendly staff and many useful facilities: IDD telephone, satelite TV, fire place, private bathrooms,..from our hotel will ensure your enjoyable stay in Sapa with us. Royal Hotel is also a trusted tourist center where you can have free information, interesting tours and qualified travel serivices. 12 Rooms view the Sapa Valley and share communal balconies, while 12 rooms (also with balconies) view the town and 3 budget rooms have no balcony. - Deluxe: rooms with balcony, 14 rooms are street view in 25m2. - Superior: rooms with fireplace & balcony for mountain view in 22m2. Our 32 rooms features best views to Muong Hoa valley, Fansipan mountain and Sapa town. All rooms have large balcony and well-decorated with many useful facilities: IDD phone, TV, freee wifi,bath tub, fire, shower, mini bar. Muong Hoa restaurant which is located inside Royal hotel brings customers a very cozy atmosphere. The restaurant is quite large and warmly decorated with unbeaten view toward Muong Hoa valley. This is the ideal place to enjoy some drinks while admiring the landscapes and to cheer with friends. The restaurant can host up to 120 guest. Our menu is quite a diversified option which varies from local cuisine to Asian and European foods. We do believe that our chief will make your meals delicious while dining with us.